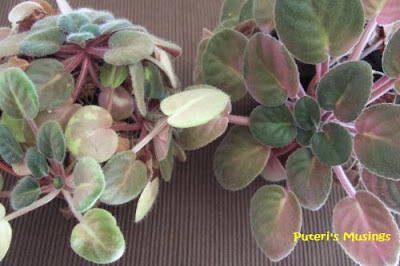 I love African Violets but I have not had much success with them. I don't know how many pots I have killed and the two surviving ones look miserable. They have not flowered in the last few years. I continue to keep them on my kitchen window sill because they are still alive! Do they look pitiful or what?! You think they look like that because I never fertilize them? Could be, eh. Haha. 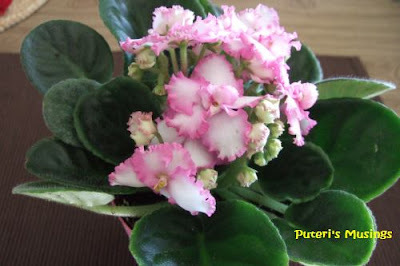 A few weeks ago, I saw several pots of African Violets at the local supermarket. I wanted to get more than one pot, but resisted, and brought one pot home instead. So far they are still alive! I was afraid that the moment I brought it into the house it will die on me! This is a pretty color. There were several colors to choose from, and after picking up and putting down a few, I finally decided on this one. I think I should start fertilizing it every couple of weeks or so, so they will bloom constantly. If it doesn't die on me before it has a chance to re-bloom, that is! Any tips on keeping African Violets healthy, anyone? Though I am into agriculture and plants are supposed to be my thing, I have somehow neglected them for so long. My wife has the greenfingers now and she loves he plants so much. I think its her way to destress herself. Enjoy looking at those pretty flowers, they can be therapeutic sometimes. Don't tell me your green fingers have now turned brown! I have never been much of a gardener, and Doug used to joke about the plants I bring home .. destined for death, that was what he said. So far most of my indoor plants are doing ok, except for the African Violets. I have not had any success with any of the maiden hair, and the ferns. Every time I bring a pot home, sure mati within a few weeks. I love looking at flowering plants too, and especially outdoors with the bees, butterflies, hummingbirds etc .. such a soothing sight! aku nang sigi enda nemu bercucuk tanam...mati magang bala tumbuhan. Pat, kasih. Hehe, aku pen semadi, semadi bala plants nya bansa ka tahan lasak! Mina di panjah dua tiga kali seminggu! Sampai layu kadang2, baru manjah.